You and your fellow adventurers explore the ruins of an ancient Incan temple, looking for turquoise, obsidian and gold. At every turn, you must decide whether to play it safe by returning to camp with the treasure you've gathered so far; or to be a truly intrepid adventurer and keep on exploring. Going farther into the ruins means risking your treasure by falling victim to giant spiders, wandering mummies, fire spouts and venomous snakes! But priceless Incan artifacts are rumoured to exist here... and you can be the one to discover them if your conquer your fears and forge ahead! What is your threshold for danger? How much treasure is enough for you? 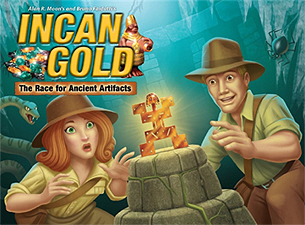 Find out by exploring Incan Gold! I must admit that this game has not been so well received in my gaming group as others in my collection, there was a general rumbling that there is not quite enough to this game compared to our standard light filler game For Sale. There is some truth to that feeling, Incan Gold is not deep by any means, but it is a fun game in its own right. The components are great, colourful cards and well written instructions make it easy to learn and teach. Its the sort of game you can play with non gaming elderly relatives without having too much hand holding as the decisions you have to make are pretty simple, you either return to camp to bank your winnings or continue on into the temple to get more treasure or meet a grisly end. The whole idea of the game is about pushing your luck, a gamble as to whether the next card is likely to be a treasure or disaster. It may not be a gamers game by any means, but its fun to play and quick enough that you could hold a number of games in quick succession without it getting too old. The fact it handles up to 8 players is a unique selling point and I can imagine that the more players you have,the more interesting those two decisions in the game become. Lets start with the components and artwork, these are extremely good and the tent cards are genius. The cards are are good quality with the artwork fitting the theme nicely, the turn order cards are a nice touch as as they are revealed they build a picture of the Temple. The gems look nice and you seem to get plenty of them. The rules are well written and colourful, with pictures used to good effect. The game itself plays quite quickly and is fun, if you are after depth of gameplay you will not find it here. What you do find is an extremely fun game that has a lot of replayability which accommodates up to 8 players providing a good filler or end of session game. As you explore the temple you find treasures, Artifacts or hazards, each turn you choose to either chance you luck and explore further into the temple or leave with your finds and return them to your camp. If you get caught in the temple when a second matching hazard is drawn you lose all of your treasures not stored in your tent. This is colourful, fun and worthy of a place in your collection.